A brave, counter intuitive proposal for freeing our children from the shackles of the curiosity-killing institution we call school, Free to Learn suggests that it’s time to stop asking what’s wrong with our children, and start asking what’s wrong with the system. It shows how we can act—both as parents and as members of society—to improve children’s lives and promote their happiness and learning. In a world of modern, involved, caring parents, why are so many kids aggressive and cruel? Where is intelligence hidden in the brain, and why does that matter? Why do cross-racial friendships decrease in schools that are more integrated? If 98% of kids think lying is morally wrong, then why do 98% of kids lie? What's the single most important thing that helps infants learn language? NurtureShock is a groundbreaking collaboration between award-winning science journalists Po Bronson and Ashley Merryman. They argue that when it comes to children, we've mistaken good intentions for good ideas. With impeccable storytelling and razor-sharp analysis, they demonstrate that many of modern society's strategies for nurturing children are in fact backfiring--because key twists in the science have been overlooked. Nothing like a parenting manual, the authors' work is an insightful exploration of themes and issues that transcend children's (and adults') lives. Best-selling author and distinguished professor, David Elkind provides parents with an understanding of and appreciation for the powerful role of "play" in healthy emotional and academic development. In modern childhood, free, unstructured play time is being replaced more and more by academics, lessons, competitive sports, and passive, electronic entertainment. While parents may worry that their children will be at a disadvantage if they are not engaged in constant, explicit learning or using the latest "educational" games, David Elkind's The Power of Play reassures us that unscheduled imaginative play goes far in preparing children for academic and social success. Through expert analysis of the research and powerful situational examples, Elkind shows that, indeed, creative spontaneous activity best sets the stage for academic learning in the first place: Children learn mutual respect and cooperation through role-playing and the negotiation of rules, which in turn prepare them for successful classroom learning; in simply playing with rocks, for example, a child could discover properties of counting and shapes that are the underpinnings of math; even a toddler's babbling is a necessary precursor to the acquisition of language. Full of reassuring advice and real-life success stories from children and parents, Easing the Teasing shows parents how to give their children the confidence and self-esteem they need to put an end to teasing. The recipient of the 2008 Audubon Medal, Richard Louv identified a phenomenon we all knew existed but couldn't quite articulate: nature-deficit disorder. Since its initial publication, his book Last Child in the Woods has created a national conversation about the disconnection between children and nature, and his message has galvanized an international movement. Now, three years later, we have reached a tipping point, with the book inspiring Leave No Child Inside initiatives throughout the country. Hailed as "an absolute must-read" by the Boston Globe and "too tantalizing to ignore" by Audubon magazine, Last Child in the Woods is the inspiring work that proves children need nature as much as nature needs children. Family physician, research psychologist, and acclaimed author of Why Gender Matters, Leonard Sax reveals the truth about what's driving the decline of American boys--and what parents can do about it. Something scary is happening to boys today. From kindergarten to college, they are less resilient and less ambitious than they were a mere twenty years ago. As for young men, it turns out the film Failure to Launch is not far from the truth. Fully one-third of men ages 22-34 are still living at home with their parents--about a 100 percent increase in the past twenty years. Boys nationwide are increasingly dropping out of school; fewer are going to college; and for the first time in American history, women are outnumbering men at undergraduate institutions three to two. Parents, teachers, and mental health professionals are worried about boys. But until now, no one has come up with good reasons for their decline--and, more important, with workable solutions to reverse this troubling trend. Now, family physician and research psychologist Dr. Leonard Sax delves into the scientific literature and draws on his vast clinical experience to propose an entirely original view of why boys and young men are failing in school and at home. He argues that a combination of social, cultural, and biological factors is creating an environment that is literally toxic to boys, ranging from environmental estrogens to the over-prescription of ADHD drugs. And he presents practical solutions--from new ways of controlling boys' use of video games, to innovative (and workable) education reforms. The Power of Appreciative Inquiry describes a new strategy that inspires people and brings about a higher performance level in any organization. This method encourages people to study, discuss, learn from, and build on what works well when they are at their best, rather than focusing on what's going wrong. The theory, practice, and spirit of this approach to organizational change is described in plain language. The authors provide guidelines for defining the change agenda, initiative, or project; forming the "steering team"; and launching an organization-wide kick off. Case histories demonstrate how organizations can attain sustained positive change by studying their strengths. Based on Wiliam Pollack's groundbreaking research at Harvard Medical School for more than two decades, Real Boys explores this generation's "silent crisis": why so many boys are sad, lonely, and confused although they may appear tough, cheerful, and confident. Pollack challenges conventional expectations about manhood and masculinity that encourage parents to treat boys as little men, raising them through a toughening process that drives their true emotions underground. Only when we understand what boys are really experiencing, syas Pollack, can parents and teachers help them develop mmore self-confidence and the emotional savvy they need to deal with issues such as depression and violence, drugs and alcohol, sexuality and love. In Raising Cain, Dan Kindlon, Ph.D., and Michael Thompson, Ph.D., two of the country's leading child psychologists, share what they have learned in more than thirty-five years of combined experience working with boys and their families. They reveal a nation of boys who are hurting—sad, afraid, angry, and silent. Kindlon and Thompson set out to answer this basic, crucial question: What do boys need that they're not getting? They illuminate the forces that threaten our boys, teaching them to believe that "cool" equals macho strength and stoicism. Cutting through outdated theories of "mother blame," "boy biology," and "testosterone," the authors shed light on the destructive emotional training our boys receive—the emotional miseducation of boys. Through vivid stories of the experiences of their patients (both adults and children), Drs. Halowell and Ratey show the varied forms ADD takes—from the hyperactive search for high stimulation to the floating inattention of daydreaming—and the transforming impact of precise diagnosis and treatment. What happens when a grown man returns to the site of his fondest childhood memories? 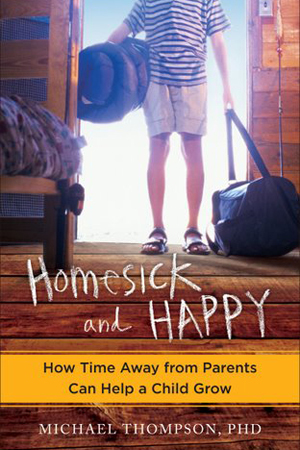 A wry, clear-eyed, and laugh-out-loud look at the transition to adulthood. Three months before getting married at age thirty-four, Josh Wolk decides to treat himself to a "farewell to childhood" extravaganza: one last summer working at the beloved boys' camp where he spent most of the eighties. And there he finds out that there's no better way to see how much you've changed than to revisit a place that hasn't changed at all. A hilarious and insightful look at the tenacious power of nostalgia, the glory of childhood, and the nervous excitement of taking a leap to the next unknown stage in life, Cabin Pressure will appeal to anyone who's ever been young, wishes he was young again, but knows deep down it probably isn't a good idea. Experts offer advice on loosening the reins and letting kids find their own way. Camp is the perfect incubator for building rewarding relationships — a life skill that today’s kids need more than ever. Kids can learn rock climbing, skateboarding, parkour and more at New England camps, and get a cognitive boost to boot. Dropping a kid off for camp can test a parent's resolve. But standing back to let a child develop autonomy is one of the most important things a parent can do. 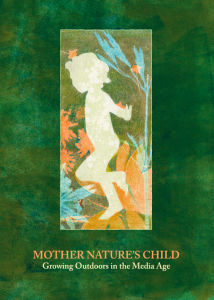 "Mother Nature’s Child explores nature’s powerful role in children’s health and development through the experience of toddlers, children in middle childhood and adolescents. The film marks a moment in time when a living generation can still recall childhoods of free play outdoors; this will not be true for most children growing up today. The effects of “nature deficit disorder” are now being noted across the country in epidemics of child obesity, attention disorders, and depression. "Mother Nature’s Child asks the questions: Why do children need unstructured time outside? What is the place of risk-taking in healthy child development? How is play a form of learning? Why are teachers resistant to taking students outside? How can city kids connect with nature? What does it mean to educate the ‘whole’ child?" Kim John Payne is an Australian who has for 24 years worked as a counselor, adult educator, consultant/researcher and educator. Kim John has been helping children, adolescents and families explore issues such as social difficulties with siblings and classmates, attention and behavioral issues at home and school, emotional issues such as defiance, aggression, addiction and self-esteem. Kim John has researched and implemented a Social Inclusion Approach in many communities, which helps overcome anti social behavior, bullying and teasing in school and at home. He is at present engaged in an extensive research project, focusing on exploring and developing a drug free approach to Attention Related Disorders. He was the Founding Director of 'The Challenge of Adolescence,' a training course for therapists, teachers and parents. Name-calling and bullying have reached epidemic proportions in schools today. Let's Get Real gives young people the chance to speak up in their own words about the real issues behind the problem. With amazing courage and candor, the students featured in Let's Get Real discuss racial differences, perceived sexual orientation, disabilities, religious differences, sexual harassment and more. From the youth who are targeted to the students who pick on them to those who find the courage to intervene, Let's Get Real examines bullying from the full range of perspectives. This poignant film educates audiences of all ages about why we can no longer accept name-calling and bullying as just a normal rite of passage. Photojournalist Dan Habib rarely thought about inclusion before he had his son Samuel seven years ago. Now he thinks about inclusion every day. Habib's documentary film Including Samuel (coming fall 2007) examines the educational and social inclusion of youth with disabilities as a civil rights issue.